Passed away Tuesday, April 12, 2016. Loving wife of Bob, dear mother to Ron (Norma Jeanne) and Sandy (Reg Jones). Grandma will be forever remembered by Karrie, Stevan, Vicki, Bekki, and Ryan. 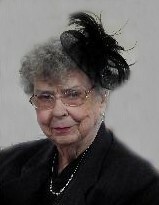 She will also be missed by her Great Grandchildren, Tyler, Micheal, Natalee, Liam, Emma and Alex. She has been a dear and loving aunt to many nieces and nephews. A cremation has taken place and her family will be celebrating her life at an event this summer.